UBCO Motorsports is a Formula SAE team composed of a group of dedicated students, each with a unique set of skills and a willingness to learn. We fully design and build an open-wheeled Formula-style race car which complies with the FSAE Rulebook over a period of an academic year. The event provides excellent technical, professional and teamwork skills! Our dedicated members work hard on the race car on top of their regular academic work, making them some of the hardest working engineers on campus. “Joining UBCO Motorsports in second year was the best decision I made throughout my degree. It allowed me to get involved on campus and feel like I was making the university a better place. Although it added more work to my day-to-day life, I never felt it weighed me down. I’m amazed at what the members of the club achieved, and just how talented they all are. Putting ourselves in the position to succeed and having the confidence to follow through and compete at FSAE events has bettered all our lives." Your gift will help the UBCO Motorsports team get to competition, and cross the finish line! 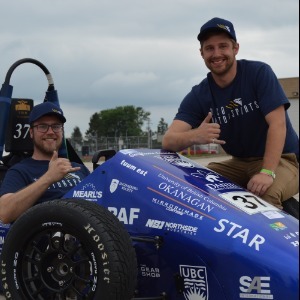 If 10 faculty and staff from the School of Engineering donate a minimum of $25 each to UBCO Motorsports, Bliss Bridal will match their gifts by donating $250 to the project.